Photo: PATH/Gabe Bienczycki. The 2017 Global Digital Health Forum experienced a 30 percent increase in participation from 2016. 1) Countries are demonstrating (really) strong leadership. It’s no secret that country ownership of digital health strategies and programming is pivotal to ensure their lasting success. Around the world, countries are in the driver’s seat when it comes to strategy development and implementation, a reality that became abundantly clear during the Forum. More than 48 countries were represented at this year’s GDHF, and over 30 percent of participants came from outside of the United States. Countries played a central role on keynote panels – for example, Olasupo Oyedepo, Project Director of the ICT4HEALTH Project (Nigeria), and Boonchai Kijsanayotin, Chair of the Asian eHealth Information Network (Thailand), set the tone for the entire Forum during the opening session. They also drove the bulk of technical sessions on everything from Kenya’s “enforcement” of their eHealth Policy to Liberia’s success with a new Electronic Integrated Disease Surveillance and Response system. 2) National and regional roadmaps are a way to overcome siloed digital health systems, projects, and investments. 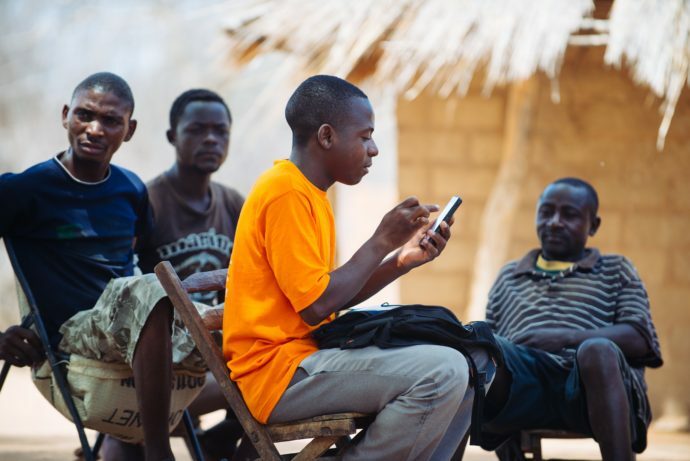 In 2017, PATH celebrated the extension of its Data Use Partnership with the Government of Tanzania, beginning the implementation of the country’s Digital Health Investment Road Map. Supported by a $15 million investment from the Bill & Melinda Gates Foundation and designed in consultation with more than 80 partners, this first-of-its-kind Road Map identifies 17 priority investments to strengthen Tanzania’s data and health sector in a comprehensive way. At this year’s GDHF, Dr. Gibson Kibiki, Executive Secretary of the East African Health Research Commission, introduced another landmark road map: the Digital Regional East African Community Health Initiative (Digital REACH Initiative) Roadmap. This document represents an innovative regional effort to bring together governments of the EAC countries, development partners, the private sector, and others to improve health outcomes by creating an enabling environment and implementing strategic regional digital health programs. A priority Digital REACH Initiative deliverable is the creation of the East Africa Open Science Cloud for Health, a real-time regional data warehouse that helps overcome fragmentation by storing and managing health data across the region. Finally, the World Health Organization Regional Office for Africa (WHO AFRO) and the International Telecommunication Union (ITU) recently launched a cross-sectoral Roadmap for Africa. This effort promotes the adoption of information and communications technology by building digital health capacity at all levels of the health system. In 2018, the initiative will host two workshops in East and West Africa to equip a cohort of promising local fellows with fundamental digital health skills. 3) Digital health tools should (usually) be open source. Digital health tools share a set of common characteristics. They’re designed to be interoperable, are used across multiple countries, receive support from a strong community of users, have been deployed at significant scale, and have demonstrated effectiveness. They’re also usually open source. One of the nine Principles of Digital Development, open source refers to technology based on collaborative efforts and community development. It’s accessible, adaptable, and seeks to deliver shared benefit for all. Many beloved digital health tools – like iHRIS, OpenLMIS, OpenMRS and DHIS2 – are open source. Numerous recent reports like the World Bank Report Digital Dividends praised open source solutions and called for additional investments to scale their use and impact. With all these benefits, it’s easy to forget that providing open source solutions is neither simple nor free. In a recent blog post on the Open Source session at the GDHF, Tenly Snow, OpenLMIS Community Manager, unpacked the dilemma behind open source. “Open source doesn’t mean it’s free – there are upfront and ongoing costs for implementing and sustaining a core open source product. Managing the partners, conversations, and processes needed to achieve feature development and community consensus for the software and initiative requires significant coordination and effort. Democracy takes work!” However, this doesn’t mean it’s not worth the effort. One key benefit of open source is that it creates the opportunity for countries to share the challenges and build common solutions, which reduces the costs of doing it alone. At the end of the day, it’s important to consider the benefits and challenges of implementing both open and proprietary solutions, and to support countries in implementing the system that works best in their context. 4) Adaptive management is here to stay. In development, it’s very common to develop a project plan, implement that plan as prescribed, and – only after the project ends – reflect on adjustments that could have been made to overcome obstacles. Adaptive management turns this model on its head. It is an iterative decision-making process that provides a framework to revisit and refine strategies and programs. It’s hardly a new concept, but adaptive management has recently gained renewed traction in the digital health community as an effective approach to enhance real-time impact. Adaptive management emerged as both an explicit and implicit theme throughout the GDHF. It is the guiding philosophy behind the many “global goods,” or digital health tools that are meant to be adapted to fit local needs and contexts, shared at the Forum. PATH is also embracing adaptive management at a programmatic level. 5) The sector has matured significantly. The fourth GDHF showcased the enormous maturation of the digital health sector in recent years. A telling example is the WHO Classification of Digital Health Interventions v1.0, or shared language to describe the uses of digital technology for health. Also referred to as a taxonomy, the classification categorizes the variety of ways in which digital and mobile technologies are being used to support health system needs. It represents an initial synthesis of proven practices in the space, and provides the foundation for the forthcoming 2018 WHO Guidelines on Digital Health Interventions. The WHO Guidelines will deliver evidence-based recommendations to countries on how to plan for and invest in digital health interventions. We don’t want to be dramatic, but the classification is a really big deal. With consistent, shared language to describe digital health concepts, tools, systems, and interventions, we can better facilitate dialogue between public health practitioners and technology-oriented audiences. The taxonomy, in conjunction with the WHO Guidelines on Digital Health Interventions and the complementary Digital Health Atlas, will help maximize the use of digital health interventions as solutions to big development challenges. Late in 2017, PATH also synthesized a set of 8 trends that are defining the future of global digital health. The major themes from the Forum – both those set forth above and others captured in recent pieces from our partners* – align with these trends. As we begin 2018, we look forward to progressing these themes and accelerating our collaboration through events such as the GDHF. *Our colleagues at Measure Evaluation and OpenLMIS also authored blogs reflecting on the 2017 Global Digital Health Forum.